Stories from Ms. Vampy to empower teen girls to make powerful choices! I am a Vampiress from Brooklyn with a mission! Do you know how many teen girls struggle with the courage to make the right choices and find their own voice? My mission is to empower teen girls to be courageous, so they can make the right choices and find their own voice. I may be over 100 years old now, but, remember, Vampires never grow up! I still feel like a teenager at heart and I still struggle with the same issues and challenges I did 85 years ago. I’ve also been through over 100 years of challenges and experiences, so I think that qualifies me as a freakin’ “expert”, don’t you? I mean, there ain’t nothin’ I haven’t seen or heard, so I am inspired to share both my mistakes and successes with you. I will also tell ya that some of my biggest successes and lessons have come from making mistakes and the wrong choices. You just gotta pick yourself up, start over and make different choices the next time. At any time, you have the power to create a "do-ova" and feel differently, think differently, dress differently and be different. I, and this book, are here to support you, guide you and honor you in areas where you are feeling stuck, confused, fearful, insecure or simply needing help. I may have only tawked to them a few times, but I know your role models like Beyonce, Lady Gaga and Taylor Swift would also tell you to “Be You…And, Be Fearless” and in Ms. Vampy words, “VAMP IT OUT!”. Brooke Lewis is a multi-award-winning Actress, Producer, Author, Board Certified Life Coach and Dating Expert. 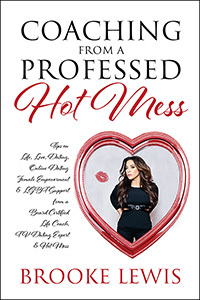 She has done writing, speaking and TV segments in media such as CBS2 KCAL9 Los Angeles, San Diego Living CW6, CBS 8 Las Vegas Now, Fox 5 Vegas, AM Buffalo, FOX 29 Philadelphia, John Kerwin Live, AfterBuzz TV, Pop Trigger TV, Brandi Glanville Unfiltered, Huffington Post, She Knows, Your Tango, Her Campus, Girls Life, Woman's Day, Female First and Meet Mindful. 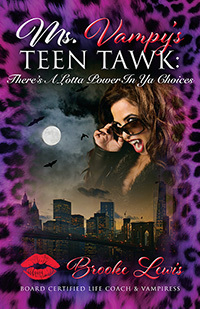 She was the Creator and Host of the award-winning talk show and web series Ms. Vampy's Tween Tawk, Teen Tawk & In Between Tawk. Brooke is also known as the sassy Co-host on the dating talk show Breaking Dating. She has empowered teens, women and men around the world, giving them knowledge they can use in their everyday lives and giving them the confidence they need to go after their dreams. Her motto is...BE FEARLESS!